Hi Friends, As you might know, Mitaka is the most recent release of openstack and is being actively discussed in cloud computing community. It aims to bring many new features and stability to the well know cloud application. In this article we will discuss how to setup this latest Mitaka release on CentOS 7 system using RDO. We will be using packstack installer in this article. Before we go into depth, lets discuss some basic requirements/terminologies. Openstack Mitaka makes it easier to manage your data center and its related resources. You can scale your cloud infrastructure components like Storage, Compute, networking resources etc to meet the ever growing computing needs of your customers. Openstack is gaining popularity at the rocket pace, so its quite obvious that it is going to be leaders in cloud computing technologies. Openstack release cycle is 6 month, which means after every six month a new release and a new set of features are added to this. Mitaka is continuation of this venture. Curious about more details and features of this release ? ; please check its documentation guides. In simpler words, its the community of people thriving to make openstack run perfectly and smoothly on RHEL and its derivatives (CentOS, Fedora, Scientific Linux). So this community is one of the most active community for CentOS/RHEL users in regards to openstack. It stands for “RPM Distribution of OpenStack” and everyone is encouraged to ask questions or contribute to this community using its official communication channel. Packstack is the installation utility that makes use of puppet application to deploy openstack. For Proof of Concept (POF) purposes, we use Packstack to install and configure openstack on a single machine. It is the easiest and automated way to get started with openstack. If you are looking to deploy RDO for production purposes on multiple hosts, we recommend using TripleO utility (we will blog about this later this week). Disclaimer: This single machine setup is just for POC (Proof of Concept) purposes, it is never recommend for Production purpose. Once you have fulfilled above mentioned hardware requirements and fresh CentOS has been installed on the system (you can use virtual machine for this purpose too), go ahead and make sure that static IP is configured on your system; otherwise disable DHCP and configure your system to use static IP address instead. Once static IP has been configured, disable NetworkManager service as openstack neutron is not much friendly with it. Temporarily disable Selinux to avoid any weird errors during installation and stop firewalld (or properly configure it to allow all required ports etc). That’t it, all pre-requisites are fulfilled now. We will go ahead with the actual installation process of Mitaka right away. On the very first step, install RPM for RDO repository by using the following YUM command. Run following command to install CentOS openstack RPM repository. Run following command to update your system packager manager to reflect these latest additions. We are on the most important stage of installation now, run following command to install Packstack utility. As soon as the packstack installation is complete, run following command to install latest openstack Mitaka. It will take sweet amount of time to complete installation, just be patient and keep looking for any possible errors. This is what you should see in case of successful installation. It will show you openstack URL and nagios login details here. 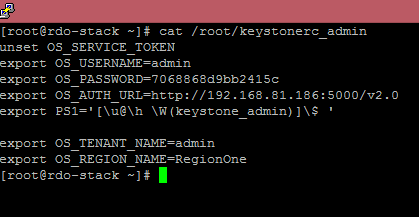 You will be able to locate openstack dashboard logins inside “/root/keystonerc_admin” file as stated in the above screenshot. Run below command to see complete rc file and admin logins. 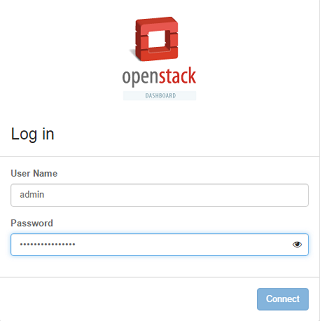 Browse openstack installation URL (http://YourIP/dashboard) and following login screen should welcome you. There you go, you are logged into your cloud portal now. Start managing your datacenter resources here. If during the installation process, you run into errors and installation halted, correct the errors inside answer file located under /root directory and simply re-run installation process by using following command; make sure to replace “packstack-answers-20160426-031606.txt” with your actual file name. There is a lot to explore in openstack Mitaka and lot more to welcome in next releases of openstack. Openstack is probably the easiest way to built your own public and private cloud start ups. Hope you enjoyed this article, just to iterate again, single machine openstack setup is not recommended for production purposes. This is just to clarify your cloud concepts and get familiar with this system. Error: Could not prefetch cinder_type provider ‘openstack': Command: ‘openstack [“volume type”, “list”, “–quiet”, “–format”, “csv”, “–long”]’ has been running for more then 20 seconds! did you encounter the same error during your setup ? This is because the machine you are running openstack setup is running out of resources, make sure enough RAM is allocated to the system. If its virtual machine, bump memory by couple of GB’s and re-run installer. I am also getting the same error, could not solve even after doubling memory to double. I have 16gb ram now. I am installing RDO in centOS. Error “has been running for more then 20 seconds!” suggests that completion of commands inside installation script are not taking place in time. so it could be either system resources or your internet might be responding very slow. Have you checked your network performance? please ensure that internet speed is reasonable for the rdo to complete, because installation process also times out if internet is slow as installer can’t fetch packages in defined time. I believe internet is fine. i ran multiple times with 2 systems, both posing the same error only during cynder_pp. Is there a way I can install all the packages and install offline. @marianc: as Aon suggested increase RAM. minimun 4GB. and you would be good. Is there somebody that has configured Mitaka with Packstack in a scenario with one server with 3 nics and 2 computes with 2 nics? Hi, Thanks for this really complete guide! And I got it installed without any errors but I can not access the dashboard! I get 404 page not found error! it appears you have specified localhost IP as the ip on which openstack services are installed so probably you might not be able to access it from outside world. However, you should be able to load openstack while browsing http://127.0.0.01/dashboard on the web browser of your dedicated server (I’m assuming your server has GUI configured).